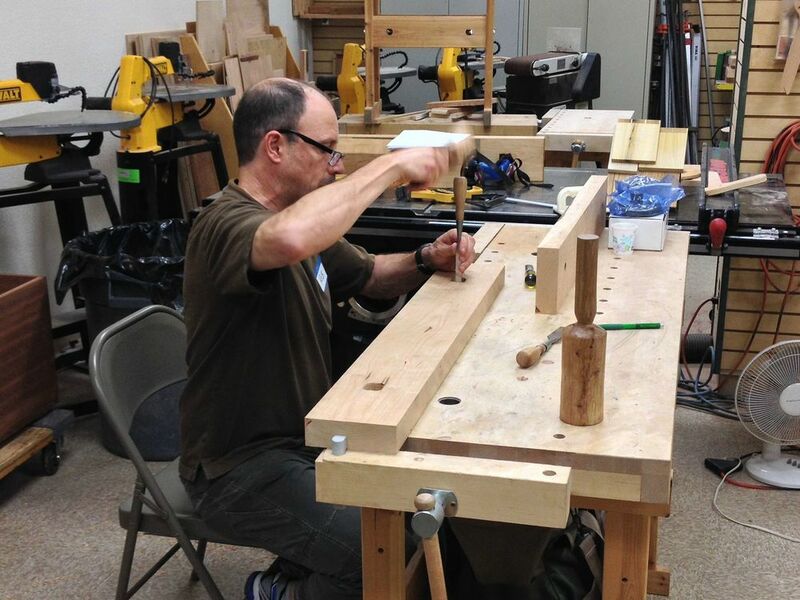 A few photos of students making their Moxon Vises in the class I taught Saturday-Sunday, June 27 & 28 2015. These were made with 8/4 cherry from Amish sawyers in Ohio, milled down to 1 3/4", with Benchcrafted hardware. Rear chops are 40" long and front chops are 36" long. We made two sizes, 5 3/4" tall and 6 3/4" tall. Students were able to pick which height worked best for them. Everyone got their vises finished and their stopped chamfer and Lamb's Tongue carved! Great class. Here the students (from left to right: Chuck, Rob, Bill) are working as a team on the drill press to bore out the holes that will accept the acme screws. After that they chopped out square mortises to house the nut that receives the screws. After the mechanical aspects of the vises were taken care of the students moved on to the stopped chamfer and Lamb's Tongue. Here they have laid out lines that will be sawn, then chopped, and cleaned up with a spokeshave & scraper to create the stopped chamfer. Now the students saw out the bulk of the waste for the Lamb's Tongue. This is then refined with chisels, files, rifflers, scrapers, and very fine sandpaper. I grabbed a couple photos of Rob with his vise. Chuck had one more face to plane on his vise (below) and then he was done. Everyone decided to add suede to the jaws at home. Bill had to take off before I was able to get a photo of his vise.